Every so often, there is a book that crawls its way into your heart and nestles itself there, almost defying explanation but demanding that it be shared with the world. 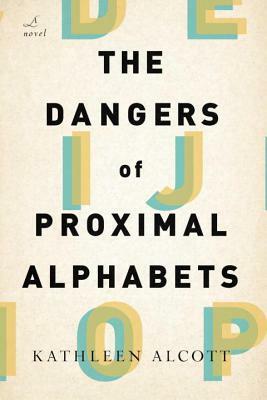 For me, A Danger of Proximal Alphabets is that book. Kathleen Alcott's debut reads more like linked vignettes than a straight narrative, moving through time in fits and starts and then in smooth progression in a way that mimics our own memory and recall of the past. The story takes its time in unfolding: Ida grew up across the street from Jackson and James. Ida's mother is dead, Jackson and James' father has left. Throughout childhood, the three are inseparable; where there is an I, there is also a J. "But even one letter changes a meaning entirely; no matter their proximity, different points of an alphabet refuse to be represented as the same: there's no guarantee that someone standing at precisely the same longitude and latitude as you will remember the view the same way, no promise that one person's memory of a moment or a month will parallel yours, retain the same value, shape the years of living that follow." "I had let myself forget: that honest-to-goodness, forever families are made of blood. That a history doesn't guarantee a future." How simple, and yet how heartbreaking--the thought that just because it has always been does not mean it will continue to be. In this way, Alcott inches her way into questions of love and friendship and family and death. Can we redefine the traditional nuclear family, setting aside "mother," "father," "siblings," in favor of "neighbor," "friend," and "confidant"? Can love last forever, even if a relationship must end? "Autumn was decidedly adult: the nuanced colors--muddled oranges and browns, the uncertain gray of the clouds--were much harder to love, to understand, than the sticky pinks of popsicles, the confident thick greens of happy grass and plants, the haughty blue of the sky above it all." Ultimately, this ability to make us open our eyes to what we already know and see is what makes The Dangers of Proximal Alphabets as successful as it is, just as any novel is heralded as among the best of the best when it makes us reconsider the familiar. I'm looking forward to seeing more from Alcott in the future--she's definitely a talent to watch out for. Note: Thanks to Other Press for providing a copy of this title for review. Opinions, as always, are my own. I don't tend to love linked vignettes but GOD do I love this title. What a wonderful title! I go back and forth on linked short stories, but this didn't read quite like a traditional set of linked stories - it was just that the pace of the novel almost made it feel that way. And yes, the title is fantastic, isn't it!? I'm with Jenny...best. title. ever.